A few weeks ago I wrote of the earliness of the season, as evidenced by one of the earliest of the early bloomers, witchhazel. It was already in bloom at Longwood Gardens in Pennsylvania, and the large bush at the front corner of my house has also since come into bloom. A reader, writing from where temperatures are colder than in my garden, wrote to tell me that he has a witchhazel that started blooming in January! I don’t doubt it. 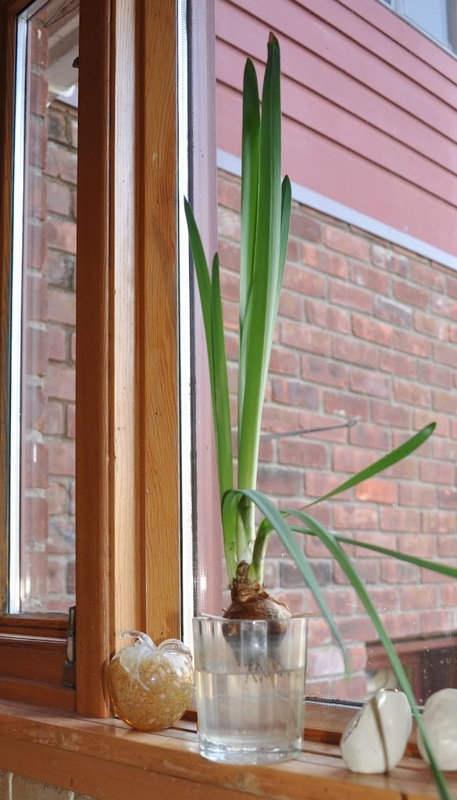 My kitchen isn’t filled with the fragrance and beauty of blooming daffodils, and I have no one to blame but — no, not myself, but — the local store where I bought the bulb last autumn. How could I have resisted? Sitting right by the checkout counter of the store was a bucket full of bulbs, each bulb only one dollar and having the makings of fragrance and beauty already locked within. Yes, “already locked within.” Spring bulbs’ flowers are initiated in the growing season before the flowers appear. The key to unlocking the pleasures lurking within most spring bulbs is cold temperatures. A period of cold weather lets these bulbs know that winter is over and it’s all right to awaken and blossom. 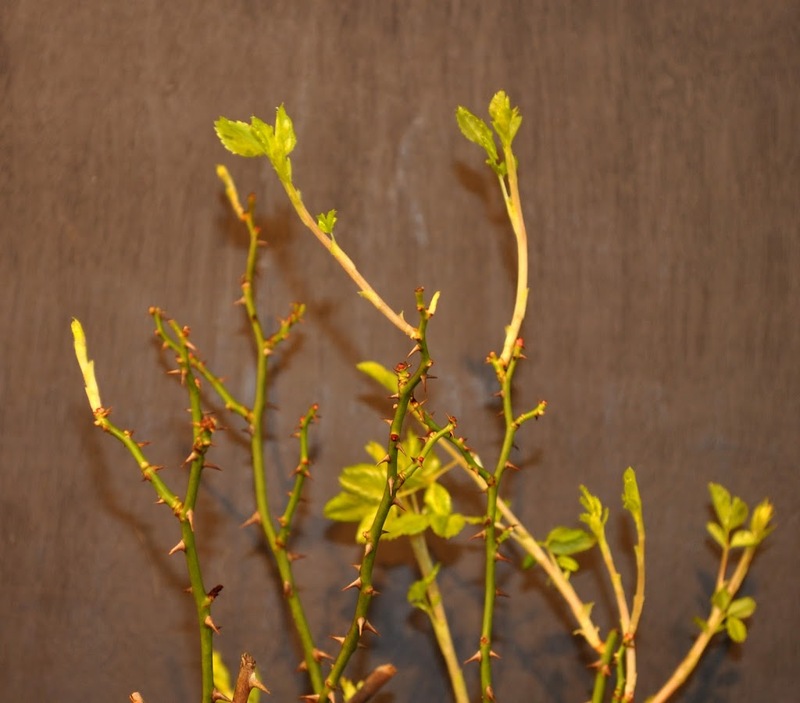 Exposure to cold happens naturally outdoors, with the flowers appearing in spring. HINTS OF SPRING – IN MY BASEMENT! Hints of spring are evident even in the dark corners of my barely heated basement. There, buds of potted roses and pomegranate plants are starting to sprout. Some gardeners — including me — overwinter potted figs in such places and their early sprouting also can cause concern. So far, only a couple of pomegranates and roses are all that have sprouted from among the 20 or so plants in my basement. 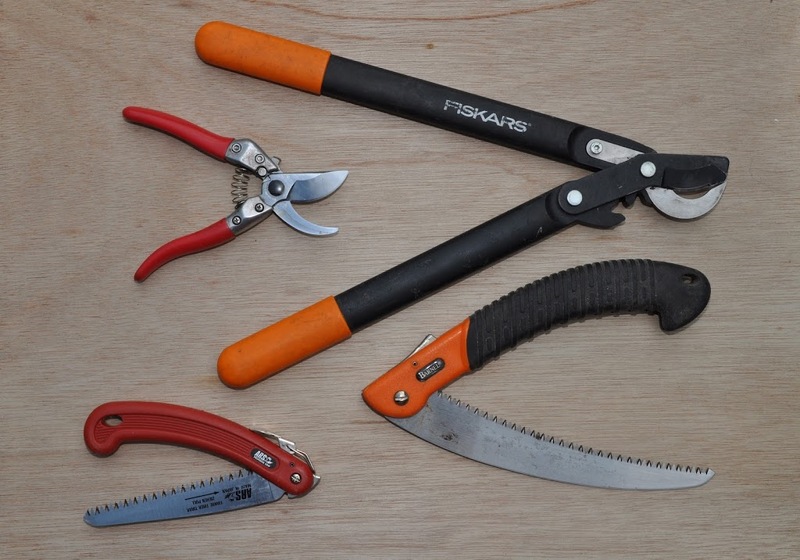 One perk of writing a book about pruning (The Pruning Book) is that I get sent a lot of pruning tools to try out. 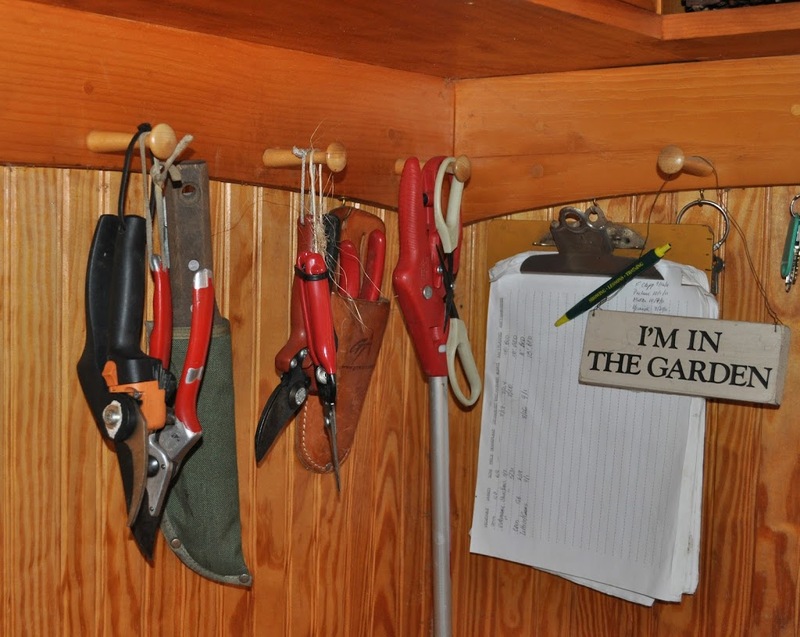 The pruning shears hang on a row of wooden pegs near my back door, loppers hang on pegs in the garage, and hand saws fill a five gallon bucket. All the big-name brands are represented, from ARS to Bahco to Corona to Felco to Fiskars to Silky. With many models of each brand of tool at my fingertips, it’s easy to tell which ones I like the best. They are the ones for which I reach most frequently. Hot off the press!!! My new book, Grow Fruit Naturally: A Hands-On Guide to Luscious, Homegrown Fruit (The Taunton Press). The book for anyone who wants to pick luscious fruit right from their own sunny balcony, suburban lot, or farmden. Sure, growing your own fruit will save money but — even better — your home-grown apples, blueberries, peaches, or oranges will be the best you’ve ever tasted and won’t be doused with toxic sprays. Available (signed copies) at http://leereich.com/books.html.